There is something about Mary, Queen of Scots, in the town of her birth, as it launches a month-long celebration of its connection to the 16th century monarch, to mark the latest cinematic interpretation of her life. 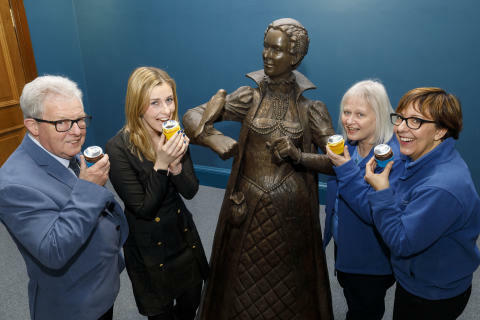 Businesses in Linlithgow will embrace the “Month of MQS” – with window displays and Mary-themed products set to decorate the West Lothian town – to celebrate the film release of Mary Queen of Scots, starring Saoirse Ronan and Margot Robbie, on 18 January. Visitors and locals will be encouraged by Visit West Lothian and Pride & Passion Linlithgow to use the hashtags #MonthofMQS and #VisitLinlithgow to create a buzz on social media and inspire more people to visit. Mary Stuart was born in Linlithgow Palace on 8 December 1542 and at just six days old was crowned Queen of Scots following the death of her father, James V. Her turbulent life culminated with her death on 8 February 1587 under orders of her cousin, Elizabeth I, Queen of England. The Scottish monarch’s connection to Linlithgow is already recognised by several businesses in the town, including tour operators Mary’s Meanders (named after the queen) and most recently the opening of Eeek! Escape Rooms’ The Blunt Axe, a game in which participants must save Mary from being beheaded. 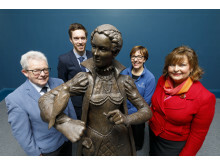 This week Linlithgow Heritage Trust gave a sneak peek of their newly restored Mary, Queen of Scots statue, a key object in the new Linlithgow Museum set to open in the spring. The statue was erected in 2002 by the Trust as a memorial to one of the museum’s founders, Tom McGowran OBE. It was created by noted Scottish sculptor Alan Herriot, who also carried out the restoration work. To coincide with the latest film’s release, national tourism organisation, VisitScotland, has created an online interactive map featuring historical and on-screen locations linked to Mary Queen of Scots, including Linlithgow Palace. On the trail of Mary Queen of Scots highlights 19 historical sites linked to Mary Queen of Scots and six filming locations, including nearby Blackness Castle, which saw its courtyard double as the entrance to Holyrood Palace in the Hollywood production. Filming of Mary Queen of Scots took place across Scotland in 2017. Tourism Secretary Fiona Hyslop said: “It is wonderful that the intriguing story of Mary Stuart has been brought to the screen. The new Mary Queen Of Scots movie offers Scotland's tourism industry an opportunity to encourage more people to come and enjoy our beautiful country. Emma Chalmers, founder of Mary’s Meanders Tours and Visit West Lothian board director, said: “We as a town are very proud to be the birthplace of Mary, Queen of Scots and are delighted that this new film gives us a chance to highlight the connections between Mary and Linlithgow. Mary’s Meanders Tours and Champany Inn are just two of the local companies working together to raise awareness of Mary Stuart and Linlithgow. Josie Rourke, director of Mary Queen of Scots, said of filming in Scotland: “We wanted to do as much as possible in Scotland and to show Mary in that environment and what her journey with it is. 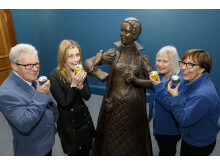 The new Linlithgow Museum in the Linlithgow Partnership Centre is set to open to the public on Thursday, 18 April. 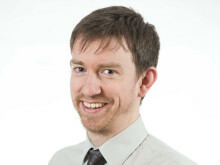 Funders of the project include the Heritage Lottery Fund, West Lothian LEADER and West Lothian Council.